Translations/reprints: Translated into Dutch as “Linda” in Tina 1975/76; Translated into Greek in Manina. Linda Lake’s father had died when she could barely remember him. Consequently she and her mother have always been close. Unfortunately Mum also developed the tendency to spoil Linda too much, and as we shall see, this has bred selfishness in Linda (though not as badly as some Jinty heroines, such as Lisa Carstairs in “She Shall Have Music“). Mum sends Linda to boarding school, but Linda can’t bear the separation because she and her mother have always been close. Moreover, she is not willing to adapt to school rules or respect that there are reasons for them, because she does not like being ordered around. As a result, she isn’t taking to the school, and it shows in difficult, selfish behaviour that does not endear her to her classmates. Only Linda’s roommate Joan shows her any friendliness and does her best to reach out to Linda. As if difficulties in settling into the school weren’t bad enough, Linda is shocked to hear that her mother is now entering a second marriage with a Mr Grant! On top of that, Linda is not even invited to the wedding because they did not want to disrupt her schooling. Then one of the girls says that sending Linda to boarding school was probably to get her out of the way, as Mum must have been as fed up with her as they are. That comment is the straw that breaks the camel’s back, and Linda’s difficult behaviour is pushed over the edge altogether. She wants to go home, and starts trying to get herself expelled. However, the staff take the view that her difficult behaviour is due to her emotional problems and give her more lenient punishments than expulsion. Linda’s classmates are more outraged though, and turn even more against her. To make things worse, Linda’s difficult behaviour unwittingly causes Joan to get injured twice, the second of which puts her in hospital altogether. At this, the other girls get so angry with Linda they throw her in the swimming pool. However, they did not think that Linda was wearing a heavy dressing gown at the time, which drags her down. So she almost drowns by the time the headmistress finds her. Not willing to sneak on the girls, Linda says she was trying to get herself expelled because she wants to go home. However, the headmistress guesses what really happened and has Mum remove Linda from the school. Before Linda goes, she goes to hospital to apologise to Joan. Joan accepts her apology but says she’s been a “silly chump”. She did not give the school a chance or tried to be friends with anyone, and she does not understand that if she wants her mother’s love she has to earn it. However, Joan will keep the door open for Linda in case there is a second chance. Linda is so happy to be coming home, but there is one thing she has not considered: it’s no longer just her and her mother. There’s now a stepfather and a stepsister, Lorette, and household arrangements have changed to accommodate them. Linda had been accustomed to having her own bedroom, but now she has to share it with Lorette. She did not like sharing her study with Joan because she was not used to such things, and she does not like sharing her bedroom now. She is not willing to call Mr Grant “Dad” (but we will for this discussion) and when she finds she is the only one in the household who does not have the surname “Grant”, she feels the odd one out. She does not even try to reach out to them although they try to reach out to her. She starts wallowing in self-pity that she is the unwanted one, just like she was at school. Not once does she think that she is not even making herself wanted, or that her selfish attitudes are making things even worse for herself. She is not friendly to Lorette, although Lorette tries to reach out to Linda and is just as kind as Joan. Linda is annoyed that Lorette is willing to call her mother “Mum” and wants things to be the way they used to be – just her and Mum. But it’s no longer the same, what with Mum having to share in Dad’s business for one thing. Linda feels left out again. Dad’s business is a boutique, which is named “Lorette” as well. We learn Lorette is following in Dad’s footsteps as a trainee dress designer and also helps out at the shop. Linda looks down on it, calling it a “rotten, poky little place”, so she is really put out to find it is hugely popular. Linda’s only friend now is a girl she meets in a coffee shop, an out-of-work fashion girl called Honey. Linda keeps Honey a secret from her family as she feels they would not approve (as it turns out, they would have good reason to if they had known). Some things are not really Linda’s fault. On one occasion she is ordered to make tea for the family. She does try, but everything turns to custard. This reinforces Dad’s view that Linda has been spoiled and needs sorting out. And now Mum has seen the helpful, sensible Lorette, she agrees Linda is a bit selfish and thoughtless by comparison. So they look into sending her another boarding school. Naturally, Linda does not want another boarding school coming between her and her mother. A turnaround comes in an odd way. Linda unwittingly burns an order Dad received while burning prospectuses that have arrived from boarding schools. To make up for her mistake (without owning up), she helps to make up the order. But she does not listen to Lorette’s advice on how to cut out the patterns, and as a result she messes things up. Lorette saves the situation, but instead of appreciating it, Linda is narked that Lorette ends up looking the clever one and she not. Meanwhile, Dad is still angry with Linda for the near-disaster. More trouble arises when Linda shoots off her mouth about the boutique to Honey, and gets invited to a party. Lorette offers to help Linda with a dress from the boutique to wear, but Linda uses a dress that she has been explicitly told not to touch. She does not realise it is Lorette’s entry for a national dress competition. Nor does she realise a photographer taking a photo of her with pop star Gary Glance while wearing the dress at the party is for the newspaper. The party turns progressively sour for Linda when she realises Honey has just taking advantage of her and her connection with the boutique, and does not really care for her. To add to Linda’s miseries, she also put a tear in the dress, which she graciously mends when she gets home. But when the family see the photo of Linda wearing Lorette’s entry in the newspaper, they are furious beyond words because Linda has gotten Lorette’s entry disqualified from the competition. To add to Dad’s rage, he has realised that Linda was responsible for the lost order along with the missing boarding school prospectuses, and thinks she did it out of spite. He is so angry with Linda that he slaps her and calls her spoilt, selfish, and hateful, and then walks right out of the house. Mum is in tears at her new husband walking out and her marriage on the verge of collapsing because of Linda, and agrees that Linda is spoiled and selfish. Linda is appalled to see how heartbroken Lorette is and crying her eyes out. Linda is struck with guilt and shame and realising that she has indeed been spoiled and selfish. So she decides to run away and not trouble them anymore, and heads to the shop to take some money to fund herself for running away. Then she finds another of Lorette’s designs that has been overlooked. Linda decides to make up for things and have the family think better of her by making up the design for Lorette and enter it for her. Once the dress is done, she parcels it up to post for Lorette later on. But in what will have serious consequences for her, she also makes a teapot for a cuppa. Ironically, Linda’s attempt to be unselfish only gets her into deeper trouble. When her family find her, they are furious at her for staying out so long and worrying the whole family, who’ve had the police out looking for her. To cap it all, it’s caused Lorette to have an asthma attack. The family decide on a clean break with a holiday in Paris – minus Linda, who is to stay behind as a punishment. Dad has arranged for his mother to mind Linda, and warns her that Gran is a crabby woman who will make Linda toe the line. Sure enough, that is what Gran comes across as when Linda first meets her. Gran tells Linda to go and open the shop. But Linda finds she has unwittingly flooded the place and ruined the clothes because she left a tap dripping and the tea leaves from the teapot clogged the sink. Linda is in hysterics because her family will think she did it on purpose and she will never convince them otherwise. But Gran soon shows she has a heart of gold under that crabby exterior. She takes the situation firmly in hand and helps Linda to not only clean up the mess but redecorate the place as well. Finally, Linda has found a friend. And when Gran is confined to bed because of her exertion, Linda devotes time to taking care of her while running the shop by herself. Linda really enjoys running the shop herself and handling the accounting. In so doing she is gaining confidence and taking the lesson of responsibility seriously. Then disaster strikes when Gran mistakenly puts Linda’s name on Lorette’s entry form for the competition. Linda is alarmed, because Lorette is surely going to think Linda stole her design. They need to head down to the organisers to sort it out. But first, they have to clear everything out of the shop by Saturday so they will be free to see the organisers on that day. Linda discovers whole new lessons in resourcefulness as she comes up with all sorts of advertising gimmicks to make sure everything gets sold out. Of course everything gets sorted out with the organiser, a Lady Dunwoody. Lorette wins first prize too. Gran also sees Lady Dunwoody about something else, which she keeps secret from Linda. When the family come back, they are in a changed mood. The break had been just what they needed. Now Dad’s anger has cooled, he has repented not letting Linda come on the trip. But they have brought back loads of presents for her. He also finds Linda is calling him “Father” now, and they are all set for a fresh start. They are really impressed with Linda’s handling of the shop. Lorette is surprised and thrilled to win first prize at the competition. Gran then unveils her special surprise for Linda: Lady Dunwoody has awarded her a special fashion prize for how well she handled the shop. It is a grant for studying fashion at college so Linda can open her own boutique when she is older. Realising the O and A levels she will need for college, Linda is all of a sudden repenting her conduct at boarding school. However, the headmistress agrees to take Linda back. Joan is waiting for Linda with open arms and says how pleased she is to see what a changed person Linda is. This story has the distinction of being the first story Jim Baikie drew for Jinty, and it was the beginning of a regular Jim Baikie run that lasted until 1980 with “White Water”. 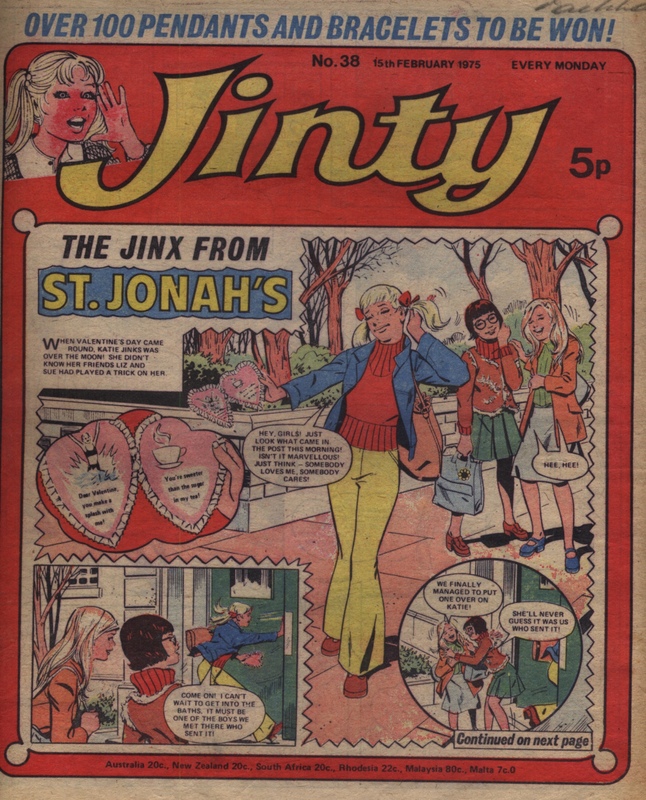 It was also the first Jinty story to use the fashion theme, which must have helped to make it popular. Girls’ stories with the theme of fashion/modelling are always sure-fire winners. Although Linda is set up as a selfish, spoilt and thoughtless girl, she starts off more sympathetic than most of these types of girls usually do. We can understand her being so close to her mother that it is painful for her to be separated from Mum at boarding school and she would naturally have trouble adjusting to boarding school. Plus there is the brutal shock of Mum suddenly getting married again without Linda actually getting to know the new stepfamily first, or even being invited to the wedding. A girl who is so used to it just being her and her mother and then suddenly being flung into a situation of sharing Mum with a stepfather and stepsister who are virtual strangers would indeed be emotionally traumatised. Even if Linda is spoilt and selfish, when we consider the upheavals and traumas Linda is suddenly subjected to without warning, we can hardly blame her for being emotionally difficult. Yet Linda is as much the architect of her own misfortunes as she is a victim of them. She imagines herself as being unwanted and left out, but she does not realise that she is not making herself wanted in the first place. She does not understand that Joan and then Lorette are trying to reach out to her because they care about her and they are not trying to make her feel unwanted. If she reciprocated their efforts and reached out to them, she would realise that she is wanted. Her own thoughtlessness also adds to her woes, such as when she tries to get herself expelled from boarding school but almost gets Joan killed in the process. If she had tried to settle into the school and made friends, she would have avoided that. Likewise, if Linda had respected Lorette’s wishes about not using that particular dress, she would have avoided that terrible trouble with her family. Linda is more prone to guilt than other selfish girls in Jinty when her actions lead to trouble that she did not intend. For example, her first impulse after that miserable party at Honey’s is to go home and own up to her parents. But she changes her mind when she hears Dad voicing his suspicions about her deliberately hiding the mail. Linda also thinks she did deserve the ducking in the swimming pool (though not the near-drowning, surely!) because her actions to get herself expelled almost got Joan killed. And when she finds Lorette’s overlooked dress design, she turns it into a conscientious effort to make things up to her stepsister. It is a cruel irony that this act of atonement has the family even more furious with her and thinking she is an even worse character than ever. And just when she was seriously trying to change and make up for things. It is another irony that another act of Linda’s thoughtlessness (not turning the tap off properly) sets in motion a series of events that turn Linda into a more mature, confident, responsible and happier person, and she is rewarded accordingly. If she had turned the tap off, it is less likely she would have developed the warm relationship with Gran, who would have continued to come across as crabby. And it would have been less likely that the muddle over the entry form would have occurred, which had the bonus of Linda receiving her own prize that sets the stage for her future career.